This week, I've been posting about my top books and other really good books that I read in 2016. Today, I'm posting the full list of books I completed* this year. 10. A Passion for God by Raymond Ortlund, Jr.
* These are books I finished reading in 2016, not the ones I started or the ones I didn't get done. I read a bunch of them for escapist fun, some for/with my kids, and a lot of them just to learn and grow. They aren't listed (perfectly) in the order I read them. Some of them I am reading for a second or third time. I read fewer books in 2016 than in previous years--it was a busy year with life going in several directions at once, and I hope to get into better habits again in 2017. As I say each and ever year--I'm not endorsing these books just because they are listed here. Some of them are really good and some are really bad. Most are somewhere in between. Read with discernment. Here's the article where I explain why I post these. Yesterday, I named my "top books of 2016." Today, I want to share some of the other good books that I had the privilege of reading which I recommend to others with a few words about what I appreciated about them. 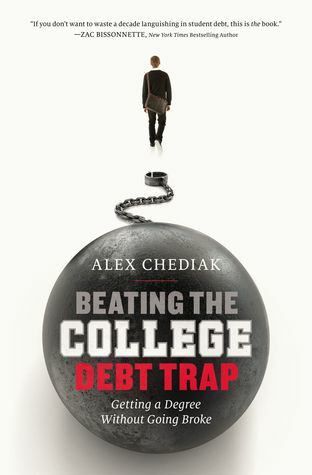 Ready-for-college-themed author Alex Chediak has done it again! In this easy-to-read guide, Alex breaks down the complex world of college financing for math and money simpletons like me and gives sound, practical, biblical counsel. The most significant thing he does is write directly to the prospective college student--not their moms and dads (though parents will profit from reading it, too). Highly recommended. Start reading it yesterday! If my wife had a top books list of her own, this one would be on hers for 2016. Heather and I will be reviewing it soon for Lifeway Pastors. 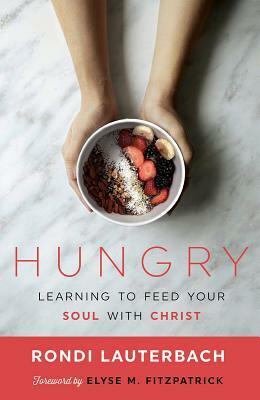 Like an encouraging and experienced friend, Rondi does a great job of both wetting our appetite for serious Bible study and convincing us that we can gain satisfying nourishment from any faithful Bible intake even with limited time to prepare. This will be our go-to book for introducing women to studying the Bible for themselves. 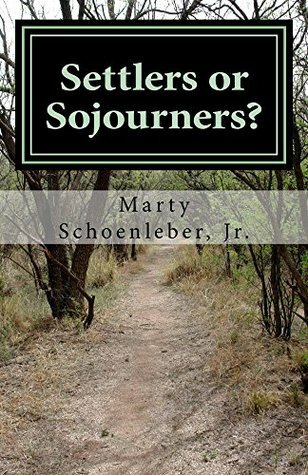 Settlers or Sojourners? by Marty Schoenleber, Jr. In this mini-book, Schoenleber wants followers of Christ to think beyond our security, comfort, and convenience. He illustratively contrasts two kinds of travelers each on a journey who might look similar on the outside but who will make radically different choices based on their internal self-identity. Even though it's only 50 short pages, the book overflows with scripture. My friend Marty wants us to re-program our minds to see ourselves as "Cross-bought" and "Cross-shaped," and he wants us to orient our lives around that new identity. Much good food for thought here. 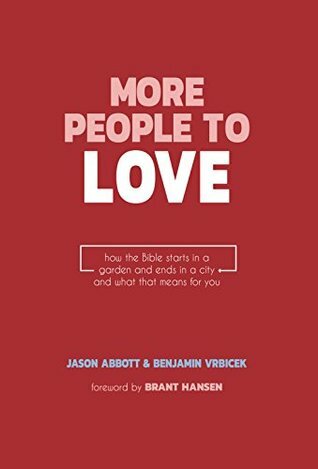 I got read an advanced version of this new book by my new online friend and fellow EFCA pastor Benjamin Vrbicek and his co-pastor. "In More People to Love, Pastors Abbot and Vrbicek nudge us to abound in love for others because of God's big plan for the world. I was both joyfully reminded of my part to play in God's grand story and challenged to think beyond myself." 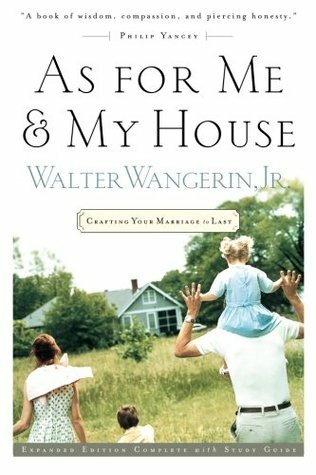 As for Me and My House by Walter Wangerin, Jr. The best book there is on the WORK of marriage. I wish I'd had known about it two decades ago (we had to learn how to do it on our own!). Dense but beautiful writing. And the word "insightful" doesn't cover it by half. A must read for people who want to do the necessary work of building a safe, happy, and holy marriage. 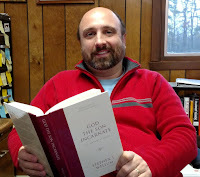 For the last several years, I've had the privilege of serving as the book review coordinator for EFCA Now, the church leaders blog of our association of churches. The perks include helping to pick books to be reviewed and free copies for myself! 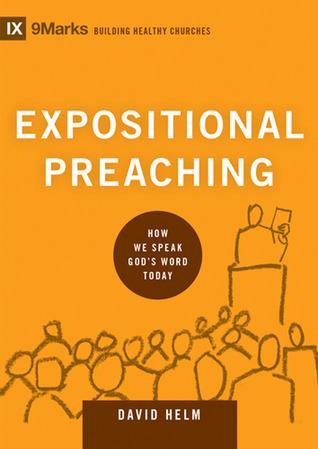 This year, I got to read these engaging books alongside our reviewers (and offer a review of my own for Expositional Preaching). One last category of good books for 2016 is the excellent commentaries I get to read as I prepare sermons and lessons for pastoral ministry at Lanse Free Church. The wild ride of 2016 has almost wound down, and it's time again to report on the good things I've had the privilege of reading this year. What I Mean By "Top Books"
The book I was probably the most excited about in 2016 wasn't really written for guys like me. It's a kids book that I wish I had gotten to read when I was a kid. The Radical Book for Kids is deceptively fun! While preteens are utterly enjoying themselves with the creative games, hands-on projects, laugh-out-loud jokes, and cool stories, Champ Thornton is radically discipling them with a crash course on Bible study methods, hermeneutics, church history, biblical theology, and Christian life and ethics. This is the kind of book that stealthily helps parents, pastors, and teachers make young followers for Jesus Christ. 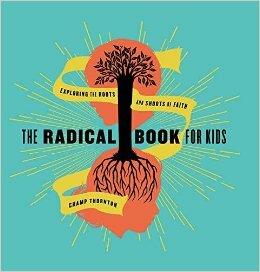 The Radical Book for Kids is a book you give your kids when they are too old for a Bible story book yet still too young for the book you're reading. I wish I knew all of this stuff when I was 10! I wish I had this book when my kids were 10! I can think of 10 kids that I want to give it to right now. When I got my copy, I read parts out loud to my family, and they chuckled, hooted, and hollered at all the right places, and they didn't realize that they were learning something important. That's a mark of a great book! This one was probably not written for me, either, but I thought it was really well done and a wonderful resource for both Muslims and Christians to read. I was first introduced to Nabeel Qureshi through reading his testimony in Christianity Today magazine and then picked up his second book Answering Jihad. No God But One is his third book and is laid out something like a debate. 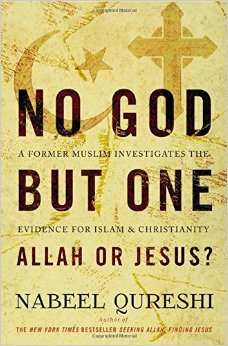 Qureshi has been a passionate apologist on both sides of the question of who is the true God, and he presents the best arguments for Allah and for Jesus in an incredibly fair way. I'm biased, of course, being a Christian pastor, but I also believe that we should be comparing apples with apples and not stacking the deck (or mix in your favorite metaphor here). Highly recommended. I've started his first more biographical book, Seeking Allah, Finding Jesus, to finish off the trilogy this year. This one was written for me (I unfortunately need it! ), and I had been waiting for it for a very long time. Ever since I learned of the ministry of CCEF and the Journal of Biblical Counseling, I've been reading the excellent (though sporadic) articles that David has written on this difficult subject, and I've also heard him teach on it in person. And for all of those years, he's been promising a book-length treatment but has been providentially hindered from producing it. 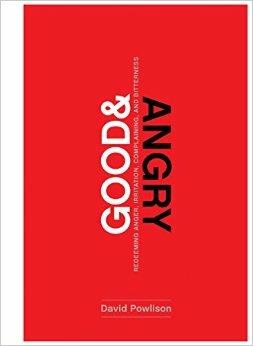 But now in 2016, Good & Angry has finally arrived, and I will be sharing it with others for a very long time. David Powlison has a unique way of seeing and saying truth. He's both feisty and humble at the same time. In Good & Angry David captures both the essence of anger and all of its contours. David is one of the wisest people there is when it comes to understanding how people tick and how the Word of God meets and changes them. Even the title says so much. I've been reading another pretty good book recently about how not to be personally offended, and I've been helped very much by it. But the author basically argues away the concept of righteous anger as a self-justifying fiction. Powlison, alternatively, would see anger redeemed and gives us biblical categories for understanding good anger (i.e. "the constructive displeasure of mercy"). Yet at the same time, Powlison never excuses sinful anger and constantly offers helpful counsel for change. Not only does he break new ground, but he does it with gentleness and grace. He writes as one struggler to other fellow strugglers, and it feels like a personal conversation. I can hear his voice in every sentence. This book is biblical counseling at its best written by one of its leading theorists and practitioners. This one was (unfortuately) also written for me. I did not enjoy this book, but, boy, did I need to read it. "Mark this down, okay? You and I were never meant to repent for not being everywhere for everybody and all at once. You and I are meant to repent because we've tried to be" (pg. 74). Reading The Imperfect Pastor quietly and slowly was an exercise in repentance for me and good medicine. There's nothing wrong with the book. It's so well-written it doesn't even taste like medicine going down. It's just that I'm sick with the disease that the author describes: pride. I just finished reading God the Son Incarnate on Christmas Eve, so I haven't had time yet to write a review, but it was definitely the topmost book I read. Wellum has done a completely masterful job of unpacking the classical teaching on the person of Christ in 467 pages. His arguments are clearly written, sufficiently nuanced/complex, and virtually comprehensive. I learned so much about my Savior and was led into true worship of the Incarnate Son. It was a perfect read for this Christian pastor during the Advent Season. More books like this need written, and I need to read more of them. What a privilege it is to get to read and recommend valuable books like these! [Matt's Messages] "The Christmas Mission"
Here’s why I picked this passage for Christmas Sunday: It tells us why there was any Christmas in the first place. 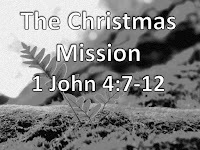 What was the mission of Christmas? If somebody asked you that question this week, why is there Christmas, how would you answer? There are a lot of great ways to answer that question. And we’ve sung a bunch of them already this morning. John’s got a really good way of saying it here in 1 John 4. 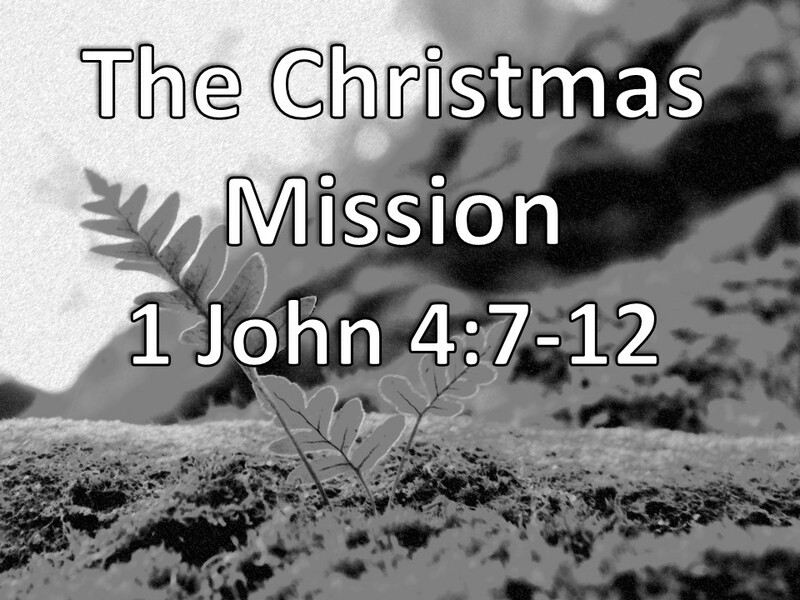 John says that Jesus, the Son of God was sent on a mission. Now, those words “sent on a mission” should sound familiar to you. Do they? 51 weeks ago, on the first Sunday of January, I preached a sermon called “Sent on a Mission in 2016." Being a sent on a mission from God has been our theme as a church for all of 2016. It’s come up again and again and again. “Go therefore and MOTHER disciples.” We said. And then our youth went to a little conference in Louisville, Kentucky called “Challenge,” and what was the theme of that conference? Because God is Father, Son, and Spirit, we are a family of servant missionaries. We are sent on a mission. Do you like to be sent on a mission? A year ago, I said that I love that sort of thing. I love it when someone has a mission for me to fulfill. Those times when Heather says, “Matthew, I need some groceries. Here’s the list. Head over to State College and bring back these items or die trying!” She never says that last part. But sometimes, it’s implied. Of course, not all missions are the same. When Heather says, “Would you take out this stinky compost bucket out to the compost pile?” I don’t get the same exciting feeling. Well, that first Christmas was a mission. But it wasn’t a mission, first and foremost, for you and me. It was a mission for the God the Son. And here was the mission: to take on flesh. To become a human like you and me. To be conceived in the womb of a virgin. To be born a baby in Bethlehem. 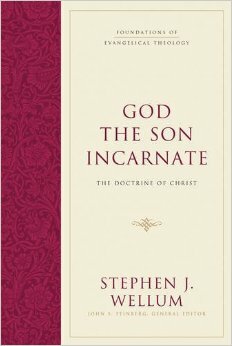 To become God the Son Incarnate. That was the mission that God the Father gave God the Son. On that night, when the angels lit up the fields and sang to the shepherds, “Glory to God in the highest,” [Rejoice!] they were announcing that the Christmas Mission had launched. God the Son had been sent. God the Son had been sent on a mission. God the Father is a sending God and God the Son is a God that’s sent. And why was He sent? John tells us here in 1 John 4. Have you already opened your presents? Some of you haven’t opened your presents yet, so you’re just waiting for me to get done so that you can go home and share a meal and some gifts. My family is planning to drive to Ohio after this. So, I’ll make this quick. I’m only going to point out the two major things about the Christmas Mission. Why Jesus was sent among us. #1. THE SON WAS SENT THAT WE MIGHT LIVE THROUGH HIM. In this passage, John is convincing his readers to love each other. We’re going to say more about that in just a minute. Love comes from God because God is the epitome of love. And verse 9 tells us that God has shown or revealed His love among us. What other verse of scripture does that verse remind you of? I can think of a couple, but one is the most famous verse in the Bible right? The Son was sent that we might live through Him. That baby was born in Bethlehem so that we might have life. Eternal life is a life-changing relationship with Jesus Christ that starts now and goes on forever. And it’s an abundant life. That’s what kind of life we get from Christmas mission. We didn’t love God. We actually hated Him. But He loved us. God demonstrates His own love for us in this, while we were still sinners, Christ died for us. For us to have life, He had to experience death. That baby born in Bethlehem was born to die. The shadow of the Cross looms over the manger. The Son of God wasn’t just sent to be sweet baby Jesus. He was sent to give Himself as an atoning sacrifice for our sins. The Father sent His Son to His death. Some missions are less desirable than others. Some missions are less painful than others. Let’s not forget in the sweetness of Christmas how painful this was. Jesus not only emptied Himself of glory, but He took the form of a servant. Philippians 2. “[Jesus] being in very nature God, did not consider equality with God something to be grasped, but made himself nothing, taking the very nature of a servant, being made in human likeness. That was the Christmas Mission. A savior has been born to you, and He will die for you. Have you come to place your faith in Him? If you have not, I invite you to do so right now. Don’t let this Christmas go by without finding new life in the Son of God who was sent as an atoning sacrifice for our sins. And if you have put your faith in Him, rejoice and live your life in Him. I think that also includes the idea of living your life for Him. A life of discipleship, of obedience of doing what pleases the Lord. He has given you a new life and wants you to live it for Him and through Him. What did the choir sing this morning? #2. THE SON WAS SENT THAT WE MIGHT LOVE LIKE HIM. But that’s not where John goes with it, is it? He’s shown us how to do it. No, it’s not easy to love others. Just because we’re fellow Christians, doesn’t make us adorable. But God’s kind of love is the kind of love that loves even enemies. So you don’t have to be adorable for me to learn to love you. I don’t have to be adorable for you to learn to love me. We’ve been loved by God. So we can love one another. Is that a line from a Christmas song? Chains shall He break for the slave is our brother. We won’t continue to oppress each other if we know how we’ve been loved. Did you expect to come to church this morning and be told that we need to learn to love better? The Son was sent that we might love like Him. Not perfectly. Love is hard for finite fallen people like you and me. But we can love truly. Is that how you’ve been treated by God? Where do you need to grow? What aspect of love needs some work in your life? Who are you having trouble loving these days? Whom do you need to show love to this week? Because we have new life in the Son, we are called to live lives of love like He taught us. Paul said, “Be imitators of God, therefore, as dearly loved children and live a life of love, just as Christ loved us and gave himself up for us as a fragrant offering and sacrifice to God” (Ephesians 5:2). But that’s our mission because the Son of God accepted His mission to seek and save us when we were lost. Jesus said, “As the Father has sent me, I am sending you” (John 20:21). Not exactly the same, of course. We aren’t all called to die on the Cross for other people’s sins. But we are called to share the good news of great joy that comes from the Savior who has been born to us. And we are called to love others in His name. On the last Sunday of 2016, we are again reminded that we are sent on a mission of love. But we are sent on mission of love because the Son was first sent on a mission of love for us. And joy to the world...the Savior came! For the entire season of Advent, we have been centering on the prophecy of the Messiah in Isaiah chapter 11. Matt Modzel read the whole thing for us just a few minutes ago. It’s really amazing. Isaiah 11:1 has been our theme for the whole month of Advent, and we’ve been memorizing it together. Let’s say it out loud. On Wednesday night, I told the kids at our Family Bible Night Christmas Program that Isaiah 11 is kind of like an Old Testament Ultrasound of Baby Jesus. It’s kind of grainy and shadowy and doesn’t look quite like a real baby, but it’s a sneak peak at the glory of what is to come. Catch this: Isaiah 11 was written over 700 years before Jesus was born. And it gives us an ultrasoundic picture, a sneak peak of the coming of Jesus Christ. Isaiah's ultrasound prophecy anticipates a time when all of the kings of Israel have been cut down to size. As kings, they were all disappointing and never lived up to their potential. These kings had just one job and they failed at it. #KingFail. They did not lead their nation into covenant faithfulness, and their people suffered for it. David's royal dynasty had declined until it was almost as good as dead. It was just a dead old stump. But in this bleak time, God was still at work. He was still keeping His promises to His people. The promises that He had made to Jesse’s son, David. God promised to bring a powerful king out of humble origins. 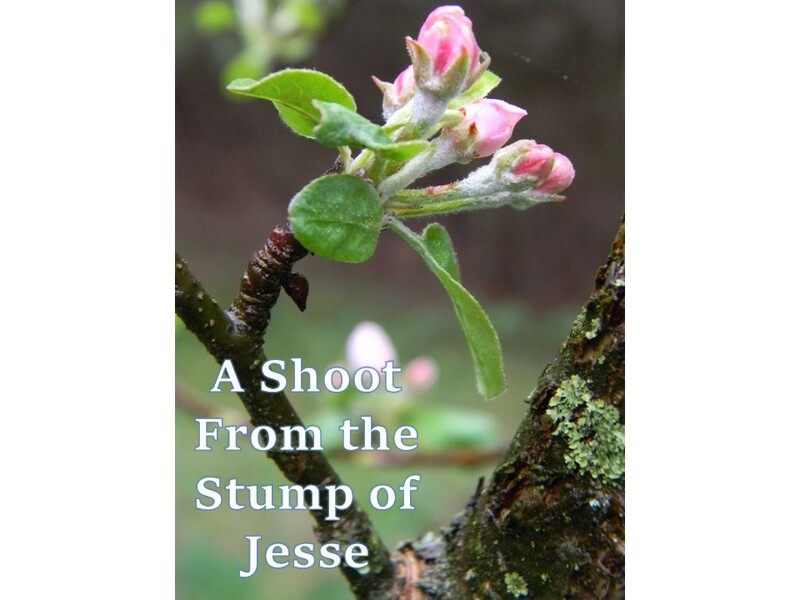 A tiny shoot will poke up from the stump of Jesse and then grow into a mighty tree. From modest roots, a magnificent Branch will one day bear flourishing fruit. Sometimes it seems as though God's promises will never come to pass. But they will. His promises are persistent, and so should be our faith. On the second Sunday of Advent, we had a sister act light "A Candle of Spiritual Power.” Carolyn, Jamie, and Victoria told us how the ultrasound of Isaiah 11 teaches that the Spirit of the LORD will rest on the coming Messiah in an unprecedented way. And we know Who this Shoot is going to be. It’s Jesus! He’s the reason we are here tonight. And He was given the Spirit without measure. Think about that! And that means that His coming rule and reign will be unimaginably glorious. Because of the unlimited Spiritual Power resting on Him, His Kingdom will be perfect. The ultrasound of Isaiah 11 says “[The Shoot of Jesse] will not judge(only) by what He sees with His eyes, or decide by what he hears with his ears (alone).” He will judge with righteousness. This ultrasound tells us what kind of clothes the baby will wear! King Jesus will never blunder, or bungle, or mishandle any situation. 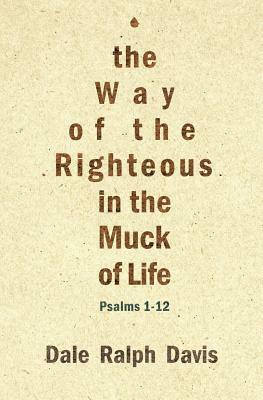 He will always choose what is right, and just, and righteous. He will never be fooled or misguided or duped. He will never be confused, befuddled, or confounded. How happy will His people be to live in an eternal kingdom with perfect justice! When the Messiah reigns, there will be absolutely no conflict, no battles, no hostilities, no war. Everything will change–even the laws of nature. Because peace will be everywhere! There will be nothing out there to harm or destroy God’s people! We live in the time between the two advents. Jesus has come and He’s coming again. And we live in between. So we know all of this about Who Jesus is and why He was born, but we are still waiting for His kingdom to come on Earth as it is in heaven. But there is coming a day when the Lord Jesus will live up to every detail of His Isaiah 11 ultrasound! One more thing to see here. It’s from v.10, and I promised to talk about it tonight. 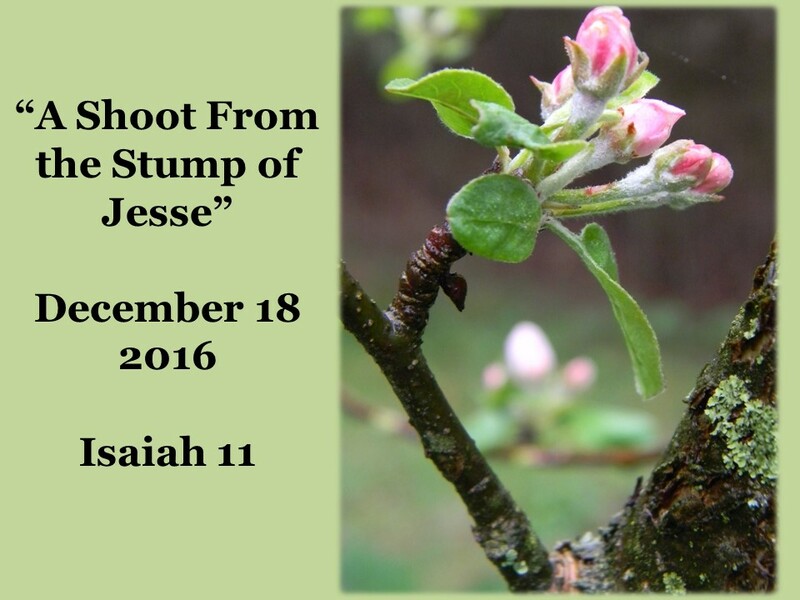 Verse 1 says that Jesus will be a shoot sticking up out of the stump of Jesse. But verse 10 says something different and mind-bending. This ultrasound says that the Baby will not just be a result...but a cause! He will be the Root of Jesse. Not just the offspring, but the source. Not just the shoot but the root! Only one way that can be. And that is if this little baby is also God the Son come in the flesh. Hunter read Micah 5:2 earlier in the service. The Lord Jesus stumped the Pharisees with the question, “If King David calls the Messiah ‘Lord’ in Psalm 110, then how can he also be David’s son? How can He be both source and offspring? Only if He is also God. On the very last page of the Bible, Jesus reminds us Who He is, and He alludes to Isaiah 11. He is both Root and Shoot. He is God in the Flesh the Messiah. And His reign and rule will be glorious. Listen again to verse 10 of the Ultrasound of Isaiah 11. For the Root and Shoot of Jesse Reigns! #1. PUT YOUR FAITH IN THE ROOT AND SHOOT OF JESSE. That’s who was born in Bethlehem that first Christmas. If you want to live in the kingdom that Isaiah 11 describes, you have to repent and become a faith-follower of the Root and Shoot of Jesse. He is the way, the truth, and life. Put your faith in Him alone. Turn from your sins and trust in what He did for you on the Cross. And if you do, then #2. LONG FOR THE KINGDOM OF THE ROOT AND SHOOT OF JESSE. It know it’s hard to live in between Jesus’ first coming and His second coming. The world we live in now is fundamentally broken. We see it every day in every story on the news. But one day soon this ultrasound will be in living color. And it will be like nothing ever seen or heard. And #3. WORSHIP THE ROOT AND SHOOT OF JESSE. Because a person who can be both Root and Shoot deserves our wonder and our marveling and our delight in Who He is and will be forever. O Come, Let Us Adore Him, Christ the King! [Matt's Messages] "A Shoot from the Stump of Jesse"
But it starts with some bad news. Jesse is just a stump. Who is Jesse again? He is the father of King David. And God made some big promises to King David, didn’t He? We call them the Davidic Covenant. A great kingdom and a kingly line that will never end, right? Well, we’ve been reading the Books of Kings. How is that kingly line turning out? There have been a few thumbs up along the way, but so many thumbs down in the line of David. Well, Isaiah predicts a day when the great royal dynasty of David has gotten to be cut down to a stump! Nothing is left but an apparently dead old stump. The kings of Israel have been cut down to size. Decimated. Sent into exile and brushed off the map. You know that’s where the Books of Kings are going, don’t you? By then end of our study of 1 and 2 Kings, both the Northern Kingdom of Israel and the Southern Kingdom of Judah will have been hauled off into exile. And that exile is what we’ve begun in studying in our Gospel Project Sunday School classes this month. The kings all failed. They had just one job and they didn’t do it! They did not lead the nation into covenant faithfulness, and everyone suffered for it. And the promises, though built on a solid root system of God’s faithfulness, seem like they are as good as dead. Have you ever felt like God’s promises have been cut down and left for dead in your life? That’s its very unlikely now that God will come through? I think we’ve all felt that way, if we’re being honest. Sometimes it just seems like God’s promises are just big old dead stump. And Isaiah would agree. They are a stump. The kings have been cut down, but God is still at work. God will keep His promises, no matter what. He still has a plan. God will bring out a shoot from that stump. Now, I don’t know anything about trees, but my wife tells me that a very healthy tree can come shooting up from a old stump. And it’s not just a new tree that got seeded in there, it’s the persistent life of the old tree bursting up and reaching towards the sun. Making another go of it. That’s the picture here that Isaiah painting. 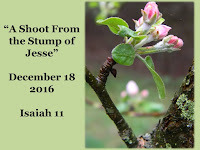 “A shoot will come up from the stump of Jesse.” You can count on it. That’s a new ruler from the old promises. Got it? Make sense? A new ruler form the old promises. “From [Jesse’s] roots a Branch will bear fruit.” You can count on it. That word “Branch” is a reoccurring title for the Messiah. It shows up in Zechariah, Jeremiah, and Isaiah. And it emphasizes the strong and growing life of the Messiah. He will come. And He will reign. #1. BELIEVE IN THE COMING OF THE SHOOT. No matter how unlikely it seems. Believe in the coming of the shoot of Jesse. Could His coming have been any more unlikely? What an unlikely story! The whole Mary and Joseph thing? The whole Nazareth thing. The whole journey to Bethlehem. No room at the inn. Born in a stable. The shepherds?! How unlikely is that to be the origin story of the Son of God, the Messiah?! Is there any other place where the Messiah is called a tender shoot? “Who has believed our message and to whom has the arm of the LORD been revealed? He grew up before him like a tender shoot, and like a root out of dry ground. He had no beauty or majesty to attract us to him, nothing in his appearance that we should desire him” (Isaiah 53:1-2). It didn’t seem like this could be the One! But in fact, He was. God always keeps His promises. And this is His biggest promise ever. This is a promise about Christmas. The Messiah will be born. But it’s also a promise about the return of Christ. It’s promise of Jesus’s first advent and His second advent. Because He’s already come. He was born. But His kingdom hasn’t come yet in all of its fullness, has it? This is a promise of Jesus’ first advent and His second advent. We live on this side of His first coming and we’re still waiting for His second coming when He will reign like Isaiah 11 predicts. Now, what kind of a ruler will this shoot from the stump of Jesse be? What will His reign be like? In a word? Perfect. More than two thumbs up. It will be every thumb up, from every objective measurement. No one has ever been so qualified as this shoot from the stump of Jesse. Look at verse 2. Wow! I could preach a whole message just on that verse! The Spirit of the LORD will rest on the Messiah in an unique way. He will have all of the spiritual power that we can imagine and all of the spiritual power that we cannot imagine! He will be unlike any other ruler that ever existed. Ray Ortlund, commenting on this passage, writes, “Unlike every other human leader in the sorry length of our history, Jesus is literally qualified to rule the world. We have nothing to fear from him. We are foolish to resist him. We can never be too loyal to him” (Isaiah, pg. 114). Do you see how this reveals His heart? Think about that! What will fill the heart of the Messiah? Delight in the fear of the LORD. The fear of the LORD is what? The beginning of wisdom. And this Messiah’s heart will be delighting in it. Have you ever met anyone who delights in the fear of the LORD? This shoot will do it perfectly. He will be all wise. And from that wisdom, He will rule in faultless justice. Verse 3. The New Testament picks up that language. I wish I had time to unpack how Paul sees this fulfilled in Jesus and His church. But the point here is that reign of King Jesus will be characterized by perfect justice. He will never be fooled. There is so much injustice in our world today, and I’m sure that I don’t know the half of it. I’m sure that my sense of justice is very off itself. I hear my kids my arguing about something, and I step in, and you know how many times I make it worse? Jesus will never make it worse. He will never blunder or bungle or mishandle any situation. He will always choose what is right, and just, and righteous. He will never be fooled or misguided or duped. He will never be confused, befuddled, or confounded. He will never get it wrong. That’s what His kingdom will be like! Justice for the poor. Did you see that in verse 4? The poor and disenfranchised often suffer the most injustice because they don’t have the resources to get that justice for themselves. But Jesus will bring it perfectly for them. He will be clothed with faultless justice. #2. LONG FOR THE REIGN OF THE SHOOT. Long for the reign of the shoot from the stump of Jesse. Because it will be utterly perfect. Unlike the world is now. Our current world is broken. Things are not the way they should be including massive injustice. Things are not right. It’s right to feel that in your bones and express your lament, to grieve over what is going on in Aleppo. To have your heart broken with the families of unarmed black men who have been killed without justice. To have your heart broken with the families of police officers who have been murdered just for doing their jobs. It’s good and right to grieve over the brokenness and injustice in our world and to long for the kingdom to come. And it will be more than simple justice. It will be peace. The Messiah has come, but He hasn’t brought this reality yet to pass. Now, I’m not sure if this is to be taken literally or not. And I’m not sure if it’s describing the millennium or the new heavens and the new earth. What I am sure of is that it means that the kingdom of the Messiah will be characterized by perfect peace. Doesn’t it almost scare you. When that little kid puts his hand into the snake’s nest? “Get away from there!” we want to say. But it’s okay. There is nothing to fear here. No conflict, no battles, not hostilities, not war. Everything has changed, even the laws of nature. Peace will be everywhere with nothing to fear. Isaiah 9 says, “For to us a child is born, to us a son is given, and the government will be on his shoulders. And he will be called Wonderful Counselor, Mighty God, Everlasting Father, Prince of Peace. Of the increase of his government and peace there will be no end” (Isaiah 9:6-7a). No end to the peace. It’s right and good to long for that. To long for the reign of the shoot from the stump of Jesse. What did the angels say to the shepherds? “Glory to God in the highest, and on earth peace to men on whom his favor rests” (Luke 2:14). Friends, I say to you, there is coming a day when there will be nothing out there to harm you. Nothing out there to harm you. Our family has been fighting all kinds of fallenness and harm this last month. Viruses, pneumonia, mononucleosis, bacterial infections, and to top it off (I hope this is the last thing) appendicitis. There has been plenty trying to harm and destroy us. And not just us! What a day that will be. No more insecurity. No more danger. No more evil. Creation restored. And the curse reversed. Right now, the curse is found somewhere wherever you look! It’s how we haste the day. #3. SHARE THE TRUTH OF THE SHOOT. Our job is to spread that knowledge of the LORD that we have already today. And we can do it with confidence, knowing that God is going to bring the nations to Jesus. Look at verse 10. But I’m not going to go there right now. Come on Christmas Eve, and hear me talk about then then. What I am going to say is that this passage teaches that you and I are going to come to Jesus. It’s about the Gentiles, isn’t it? The nations. Not just the Israelites, but the nations. The Apostle Paul quoted this very verse in Romans chapter 15, verse 12 when he was making his point (again!) that God has a plan, not just for the Jews but also for Gentiles. Do you remember that? Remember Romans 15? It was just last January that we were in it together. Here’s how Paul said it: “For I tell you that Christ has become a servant of the Jews on behalf of God's truth, to confirm the promises made to the patriarchs so that the Gentiles [that’s you and me!] may glorify God for his mercy, as it is written: ‘Therefore I will praise you among the Gentiles; I will sing hymns to your name.’ Again, it says, ‘Rejoice, O Gentiles, with his people.’And again, ‘Praise the Lord, all you Gentiles, and sing praises to him, all you peoples.’ And again, Isaiah says, ‘The Root of Jesse will spring up, one who will arise to rule over the nations; the Gentiles will hope in him.’ May the God of hope fill you with all joy and peace as you trust in him, so that you may overflow with hope by the power of the Holy Spirit.” (Romans 15:8-13). We can share the truth of the Shoot confidently, knowing full well that God is going to use our sharing to bring the nations to trust in Jesus. Who have you recently told about the Messiah that has come and is coming again? This is what we saw back in Romans 11. A future for ethnic Israel. God is going to call His covenant people back to Him. To reclaim the remnant. And He’s going to undo the split that came with Rehoboam. Now, again, I’m not sure how much of that to take literally. I lean towards reading this as evocative word pictures drawn from the map of the day to say that God will certainly rescue His people once again in a new and greater exodus that will cover the whole map. Not just from Egypt to Israel but from one corner to every corner of the world. God will make a way where there seems to be no way. God will fix everything so that things are the way they are supposed to be. God will save a people out of the Gentiles. And God will reclaim the remnant of Israel. The whole earth will be full of the knowledge of the LORD as the waters cover the sea. And it’s our job to share it. It’s a sure thing. It’s a done deal. It’s more certain than that the sun will rise tomorrow. It may not seem like it. It may seem like God’s promises are just a dead stump. But out of those promises will rise the Shoot of Jesse. And He will not stay tender and small forever. The Spirit of the LORD will rest on Him and His kingdom will be perfect in justice and peace forever and ever. Let’s tell some folks about that this week. Our first candle was a candle of persistent promise. Even though the dynasty of David had dwindled to almost nothing, God was still at work. A new king would arise, a tender shoot sticking up from the stump of Jesse. We know that this slender twig will be Jesus Christ, and we know what His reign will be like. Our second candle was a candle of spiritual power. The Spirit of the LORD will rest on the Messiah so that He will have every spiritual resource needed to bring the promised Kingdom in all of its fullness. Jesus will be called “The Prince of Peace” because there will be no end to the increase of peace under His eternal rule. We can not imagine what it will mean for there to be absolutely no conflict, no battles, no hostilities, no war. Everything will change–even the laws of nature. Because peace will be everywhere. May our fourth candle shine to remind us that the peace of King Jesus will be perfect forever and ever. Our first candle was a candle of persistent promise. Even though David’s royal dynasty had dwindled to almost nothing, God was still at work. A new anointed king would appear, a tender shoot sticking up from the stump of Jesse. We know that this slender twig is Jesus Christ. Our second candle was a candle of spiritual power. The shoot from the stump of Jesse will not be small forever. Through the fullness of the Spirit, it will grow to be a powerful tree that will tower over the ages and never be toppled. Our third candle is a candle of faultless justice. How wonderful it will be for Jesus to reign on Earth! He will never blunder, or bungle, or mishandle any situation. He will always choose what is right, and just, and righteous. King Jesus will never be fooled or misguided or duped. He will never be confused, befuddled, or confounded. How happy will His people be to live in an eternal kingdom with no injustice! Let us long for the kingdom of faultless justice. May His Kingdom come on Earth as it is in Heaven. 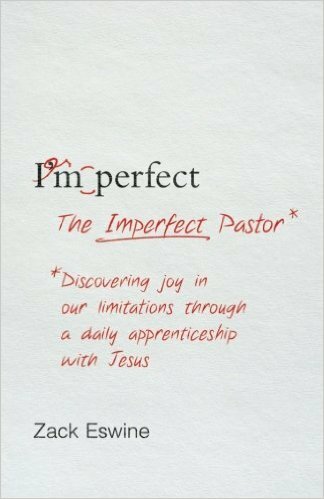 Book Review: "The Imperfect Pastor"
Reading "The Imperfect Pastor" quietly and slowly was an exercise in repentance for me and good medicine. There's nothing wrong with the book. It's so well-written it doesn't even taste like medicine going down. It's just that I'm sick with the disease that the author describes: pride. Highly recommended for new pastors just learning their craft and for older pastors who have not yet discovered joy in their limitations. 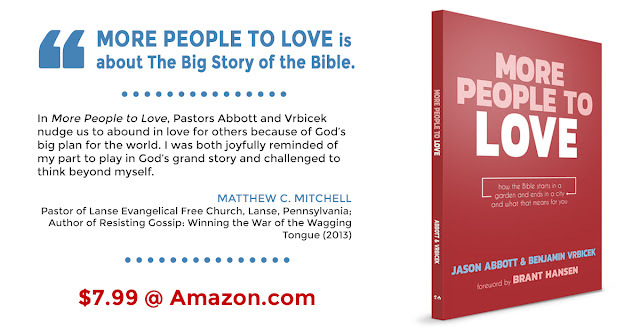 This is a new book out just today by Jason Abbott and Benjamin Vrbicek. I got to read a pre-pub version and offer an endorsement. 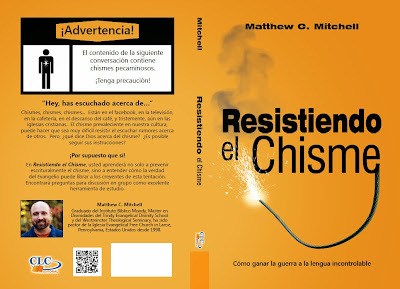 E-Book Versions of "Resistiendo el Chisme"
This is so encouraging to me, especially because I know it's already being used in online classes for Christian leaders by educators like Dr. Tim McIntosh. Tim had asked for a digital version for his students, and the good folks at CLC Colombia and CLC Publications made it happen! 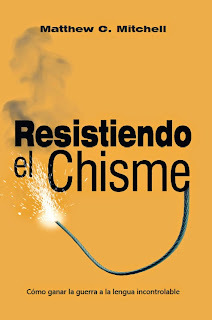 When it first came out, Resistiendo el Chisme was featured in a 18 minute segment on the morning show of Channel One television in Colombia (see YouTube Video below). When I wrote the original book, I never expected it to be used by people all around the world. Praise the Lord! Our first candle was a candle of persistent promise. Even though the dynasty of David had dwindled to almost nothing, God was still at work. A new king would arise, a tender shoot sticking up from the stump of Jesse. Who will this king be? The next verse gives us a hint. Our second candle speaks of this promised ruler’s spiritual power. Four times in one short verse, Isaiah tells us that the Spirit of the LORD will rest on this king, and he describes the Spirit as providing wisdom and understanding, counsel and power, knowledge and the fear of the LORD. Clearly, this coming ruler will possess the Spirit of God in an unprecedented way. Who will this king be? It must be Jesus! With all of that spiritual power at His disposal, how glorious will be the Messiah’s rule? The shoot from the stump of Jesse will not be tender and small forever. It will grow to be a powerful tree that will tower over the ages and never be toppled. Rejoice! Because of the fullness of the Spirit, King Jesus will have everything He needs to rule in power and perfection forever. I’m going to read a lot of scripture to you today (three chapters worth), but don’t you worry, I absolutely guarantee that it will not be boring! These chapters are probably the most exciting chapters (and most gruesome) in the whole second book of kings. Action, adventure, blood, death, intrigue, suspense–these chapters have them all! This is big story about the justice of God. I tried to think of how to divide this up into shorter portions for preaching, maybe a chapter at a time, but I really think that these next several pieces all flow together to tell one big story about how our God brings perfect justice and rights every wrong. Now, perhaps, you haven’t been waiting for that in this book. And that’s my fault (at least a little). Back in 1 Kings, the LORD promised to bring justice to against the Ahab, Jezebel, and all of Ahab’s children. Do you remember that? Ahab was a six-thumbs down king. The worst ever by far at that point. And he married an 10-thumbs down queen. And they killed the prophets of Yahweh by the dozens. By the hundreds. Maybe by the thousands! And they brought in the worship of Baal and Asherah. They led the country into rank idolatry. And though Ahab died at the end of 1 Kings, Jezebel has yet died. And Ahab’s son is the king. His line has continued. It’s actually Ahab’s grandson who is the current king! For the last few months I should have pointed this out every Sunday when I preached from 2 Kings. In 1 Kings 19 when Elijah heard the small, still voice, he was told to anoint Elisha and also see that Hazael was anointed king over Aram and Jehu king over Israel. Elijah went to heaven on a fiery chariot before those things were accomplished. And Elisha hasn’t done them yet, either! He’s healed the waters and the death in the pot. He’s taken care of widows. He’s taken care of Syrian generals with leprosy! He’s made an axhead float. He’s blinded Arameans and opened the eyes of his servants. He’s lifted a famine and made some lepers very happy and sent the Arameans packing all by Himself. But so far, no justice. We’ve just about reached the end of the story of Elisha, and it’s all about God’s avenging justice. 2 Kings chapter 8, verse 1. “Now Elisha had said to the woman whose son he had restored to life, ‘Go away with your family and stay for a while wherever you can, because the LORD has decreed a famine in the land that will last seven years.’ The woman proceeded to do as the man of God said. She and her family went away and stayed in the land of the Philistines seven years. Remember this lady? She was mom in chapter 4 whose son died and then the LORD through Elisah brought him back to life. She’s had to move away and when she got back someone (maybe the government) had seized her land. It’s surprising to see Gehazi here because he was given leprosy back in chapter 5. Perhaps this story is out of chronological order–the Bible writers often do that–or perhaps the king doesn’t care that he’s leprous. He’s getting used to have lepers around. I love that story! It’s a great story about how there really are no coincidences and that God’s timing is absolutely perfect. And it’s a story about how God arranges things so that there is justice. Now, what should we be saying when read that? “Huh. That’s great. She got justice. Now, this is a turning point in the story of Elisha. He’s been doing miracles that bring grace and life, but now he’ll be prophesying mostly judgment and death. He goes out of the country to Syria. It doesn’t say why, but he’s nearby to the king of Aram, Ben-Hadad who has been the enemy of Israel for many chapters now. And Ben-Hadad is sick and is worried about his future. He’s learned by now (maybe from Naaman) that Elisha can tell the future. So he sends one of his guys to find out what is going to happen. And his guy’s name is Hazael. And that should ring bells for you and for me. In 1 Kings 19, the LORD told the prophet to anoint Hazael king over Aram. I told you that this wouldn’t be boring! There’s an assassination for you right there. Elisha tells Hazael that Ben-Hadad would recover just fine if he was allowed to. But Hazael will murder him in his sleep and take over the kingdom. God has shown this to Elisha. It’s part of His plan. But he takes no pleasure in it. “God says it will happen.” Which is no excuse for what he does. Hazael takes matters into his own hands and becomes the king of Aram by treachery. Now, how about the kings of Judah and Israel? We haven’t seen much of them for the last few chapters. The king of Judah almost not all. Thumbs up or thumbs down, right? He married into and followed the wicked family in the North. Jehoram son of Jehoshaphat was nothing to write home about. He barely survived and his kingdom shrank under his rule. Now, I’m not going to spend any time explaining all of that, but I’ll just say this. If you do the math on the reigns of these two kings, North and South, Joram son of Ahab in the North and Ahaziah son of Joram in the South, you find out that both of these guys are due to die in the same year. And here they both are in the same place. Jezreel. And the king of the north has a military leader that has the name Jehu. Everything is now in place for God’s vengeance to fall. So the young man, the prophet, went to Ramoth Gilead. When he arrived, he found the army officers sitting together. ‘I have a message for you, commander,’ he said. ‘For which of us?’ asked Jehu. ‘For you, commander,’ he replied. Jehu got up and went into the house. Then the prophet poured the oil on Jehu's head and declared, ‘This is what the LORD, the God of Israel, says: 'I anoint you king over the LORD's people Israel. I told you it wouldn’t be boring! Do you know what this makes Jehu? It makes him a Messiah. What does Messiah mean? An anointed ruler. Jehu is the only king of the northern kingdom to be anointed. And he is anointed to bring God’s vengeance. We don’t like that word. For most of us vengeance conjures up the connotation of meanness, beastliness, unrighteous anger. But when vengeance is decreed by God, it means justice. It means righting the wrong and making everything right by righteous force. The time has come for God to avenge the blood of His servants. So Jehu son of Jehoshaphat, the son of Nimshi, conspired against Joram. (Now Joram and all Israel had been defending Ramoth Gilead against Hazael king of Aram, but King Joram had returned to Jezreel to recover from the wounds the Arameans had inflicted on him in the battle with Hazael king of Aram.) Jehu said, ‘If this is the way you feel, don't let anyone slip out of the city to go and tell the news in Jezreel.’ Then he got into his chariot and rode to Jezreel, because Joram was resting there and Ahaziah king of Judah had gone down to see him. How many times have we seen that God always keeps His promises? How many times do we need to be told that that includes His threats? Jehu has killed, not just one king today but two. Not just the king of the Israel in the north, but the king of Judah of South. What will happen down there? And has Jehu gone too far? I told you it wouldn’t be boring. Jehu has not come in peace. He’s come in vengeance. The LORD’s vengeance. Then Jehu wrote them a second letter, saying, ‘If you are on my side and will obey me, take the heads of your master's sons and come to me in Jezreel by this time tomorrow.’ Now the royal princes, seventy of them, were with the leading men of the city, who were rearing them. When the letter arrived, these men took the princes and slaughtered all seventy of them. They put their heads in baskets and sent them to Jehu in Jezreel. When the messenger arrived, he told Jehu, ‘They have brought the heads of the princes.’ Then Jehu ordered, ‘Put them in two piles at the entrance of the city gate until morning.’ The next morning Jehu went out. He stood before all the people and said, ‘You are innocent. It was I who conspired against my master and killed him, but who killed all these? I told you that it wouldn’t be boring. Now I’m sure he could have made the excuse that the two royal families have intermarried, and so this was bringing God’s justice to bear on them. But just like killing King Ahaziah wasn’t in his marching orders, I’m pretty sure that killing these guys wasn’t either. But he’s got the taste of blood now. “After he left there, he came upon Jehonadab son of Recab, who was on his way to meet him. Jehu greeted him and said, ‘Are you in accord with me, as I am with you?’ ‘I am,’ Jehonadab answered. ‘If so,’ said Jehu, ‘give me your hand.’ So he did, and Jehu helped him up into the chariot. Jehu said, ‘Come with me and see my zeal for the LORD.’ Then he had him ride along in his chariot. Now summon all the prophets of Baal, all his ministers and all his priests. See that no one is missing, because I am going to hold a great sacrifice for Baal. Anyone who fails to come will no longer live.’ But Jehu was acting deceptively in order to destroy the ministers of Baal. [It’s a plot.] Jehu said, ‘Call an assembly in honor of Baal.’ So they proclaimed it. I’m sure the Israelites never thought that that could happen. Remember just a few pages ago how there were Baal priests everywhere and it seemed like Baal worship would never end? And one day it did. One day it was gone, just like that. Because the Jehu the messiah came and through him the Lord avenged the blood of His servants. Yet Jehu was not careful to keep the law of the LORD, the God of Israel, with all his heart. He did not turn away from the sins of Jeroboam, which he had caused Israel to commit. In those days the LORD began to reduce the size of Israel. Hazael [as prophesied] overpowered the Israelites throughout their territory east of the Jordan in all the land of Gilead (the region of Gad, Reuben and Manasseh), from Aroer by the Arnon Gorge through Gilead to Bashan. It’s very bloody story and hard to stare at, isn’t it? I love that the prophet, when he sees the future weeps over the vengeance to come. But I also love that the vengeance shows us God’s perfect justice. Let me give you three very quick points of application. #1. MARVEL AT THE PATIENCE OF GOD. When we see all of that vengeance fall, we can easily forget that God has been very patient with everybody concerned. Chapter after chapter people are given the opportunity to repent and make amends. But Jezebel just suits up and puts on her Maybelline. It’s amazing that we are not all toast, isn’t it? I know that I have a hard time being patient and longsuffering with people. And I don’t have the responsibility of bringing justice for my servants the prophets who have been slaughtered! The apostle Peter says, “The Lord is not slow in keeping his promise, as some understand slowness. He is patient with you, not wanting anyone to perish, but everyone to come to repentance. [But he won’t be patient forever.] But the day of the Lord will come like a thief. The heavens will disappear with a roar; the elements will be destroyed by fire, and the earth and everything in it will be laid bare” (2 Peter 3:9-10). But right now, He’s being patient. And so should we be. Because His timing is not off at all. He can swoop in and connect the Shunnamite mom with the king at the very moment when Gehazi is telling the very story of her son. He doesn’t get the timing wrong. Ever. He’s being patient. And that should make us marvel and also repentant. Don’t put off your repentance thinking you’ve got forever! You don’t know how much time you have. He does, but you don’t. He always keeps His promises, including His threats. He’s just being patient right now. #2. TREMBLE AT THE VENGEANCE OF GOD. When the LORD finally does unleash His justice, it is terrible to behold. And don’t think that this just an Old Testament thing with God. This Summer we read the book of Revelation together in our Family Bible Week class. God promises to avenge the blood of His servants, and He will. What happened to Jezebel, what happened to the priest of Baal, is a picture of what will happen in the final judgment. And it will be the Messiah who does, God’s Anointed One. Read Revelation 19 some time. And tremble. Here are a few verses from it. And unlike Jehu, he won’t make any mistakes. He won’t go too far or not far enough. His justice will be just right. The answer is, there will be peace when Jesus brings it in full. Don’t look away. Know that this is our God. Our God is not just a kind and merciful God. He’s not just an old uncle who loves to hand out presents at Christmas with a twinkle in his eye. And He will avenge the blood of his servants. Tremble with joy at that! I mean it. It is good news that God is just and will bring perfect justice to the world. Nobody will get away with anything. He’s going to bring us perfect justice! Does it feel like they’re going to get away with it? Their sin will either be judged at the Cross or in the eternal judgment. And it will be perfectly dealt with. Justice will be done and will be seen to be done. 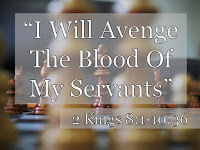 God will avenge the blood of His servants. #3. HOPE IN THE GRACE OF GOD. Jehu dies and things are not perfect yet. But there is another king coming who will make everything right. He’ll be two thumbs up, everything thumb you can think of up! And He will perfectly balance grace and justice. In fact, He will take the justice on Himself. He will take God’s vengeance on Himself. That’s what the Cross is, isn’t it? The wrath of God applied to the Son of God. The just vengeance of God applied to God the Son. That’s what this table is all about.